Proposition 37 Fails to Pass in California | That's Bad For You! Well folks, unfortunately the pitch for GMO labeling didn’t get through. Prop 37 was successfully gained 47 percent of California’s votes, but big company names like Monsanto, PepsiCo, Coca-Cola, Kellogg, General Mills, DuPont, Bayer and other food and pesticide companies put forth nearly $45 million to fund the “No on Prop 37” campaign, and won. According to Natural News, this same campaign has a criminal complaint filed against it with the FBI. The campaign was linked to an alleged criminal fraud in which it used a fake FDA quote and sent out mailers fraudulently using the FDA seal. Tisk, tisk, tisk! Be not discouraged people! 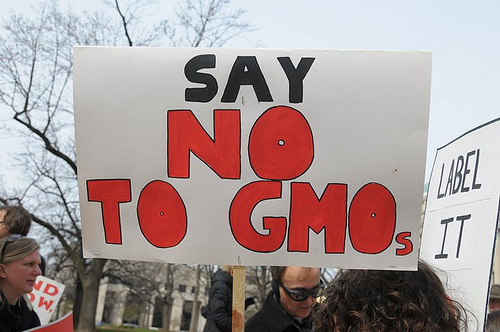 The battle for GMO labeling has just begun! This fight has spread substantial awareness about GMOs both nationwide and worldwide making people question the idea of GMOs and what exactly is in their food. In due time, our rights will be acknowledged. We are more than 4 million votes closer to victory. Their secret is out and we wont stop until until GMO labeling becomes a law. Don’t give up the fight! Continue to support GMO labeling! This entry was posted in Bad For No Reason, GMOs, Interesting and tagged Bayer, Coca-Cola, DuPont, FDA, General Mills, GMO Labeling, GMOs, Kellogg, Monsanto, PepsiCo, Proposition 37 by thatsbad4u. Bookmark the permalink. Even though Proposition 37 was not passed, other large companies have started to label products with GMO or have removed GMO? And are they legally allowed to do this even though the Prop didn’t pass? Not sure what you’re asking here. Are you asking if food companies have started labeling foods GMO even though Prop 37 didn’t pass? Not sure about that Mavis, but I highly doubt it..